India’s opening fixture against Thailand will kick-off at IST 7pm at the Al Nahyan Stadium tomorrow (January 6, 2018), and will be telecast live on Star Sports 3, and streamed live on Hotstar as well. This is India’s fourth participation in the AFC Asian Cup, the last being in Doha in 2011. On the other hand, Thailand’s best result in the Continental championship came in 1972 when they finished third. Since then, they have failed to overcome the group stage hurdle in all the five occasions they qualified for the final round. India had finished second in the 1964 edition of the AFC Asian Cup. 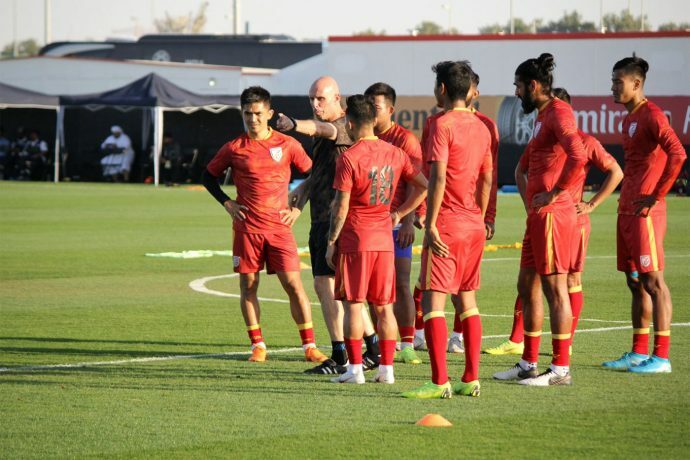 Building up to the Continental Championship, Oman, who were held to a goalless draw by the Blue Tigers, got the better of Thailand three days back in a friendly fixture played behind the closed doors in Abu Dhabi. But Constantine brushed aside on being asked whether India will have a psychological advantage when the Blue Tigers face the War Elephants. “They are different teams with a different set of players. Oman were trying out different players, and so were Thailand,” he commented. “Thailand are a very good side and they are not to be underestimated at all. We’re in no position to underestimate anybody. We have to take one game at a time. We’ll give everything we have as we have continued to do in the last four years. We’ll obviously do our best to get the result that we need,” he stated. A lot of travelling fans — the Blue Pilgrims have already landed in Abu Dhabi to cheer for the Blue Tigers. At the same time, a lot of expatriate Indians are also expected to throng the Al Nahyan Stadium to cheer loud. “We need the support of our Indian Friends from Abu Dhabi and all over the UAE,” the Coach urged. “It’s not every day you go and see the Indian National Team play in the Asian Cup, and now it’s at your doorstep. This is a huge event as well as a huge opportunity for the Indians to see their National Team play at the highest stage in the continent,” he pronounced. “Personally, it’s a proud moment for me to lead India to the Asian Cup. It has been a long difficult road which took more than three years to get here. AIFF believed in me and allowed me to continue,” he maintained. “The 1-0 win against the Kyrgyz Republic at home was something special. Apart from that, beating Myanmar in Myanmar after 64 years was a great result for us. It was the opening game of the final qualifying round. The result gave us the confidence to go forward,” he pronounced. Significantly, India had to traverse the longest path than anyone else to qualify to the quadrennial continental championship. India had played 18 matches, most by any team, to have cemented their berth in the AFC Asian Cup UAE 2019.